The weather was quite nice yesterday late afternoon and DH and I decided to spend a little time enjoying our yard. We heard a shrill noise coming from one of our trees and could not quite put a finger on whether it was a bird or what. Walking around we figured out what tree it was coming from, a large oak near the back of the house. We were standing under it looking up and an object dropped on the grass under the tree in front of us and a large owl flew away. It was a baby squirrel, and it was what was making that shrill noise. The poor thing. I wasn't sure it would survive such a large drop and we stood there not quite knowing what to do. We thought about it for a while and could see the little guy was still breathing. We stepped away a ways to see if his mom was coming to get him but after several minutes, nothing happened. After a while DH picked it up and I hit the internet to see what to do. I immediately found a local site with a number to call for volunteers who take care of the little guys and called them and left a message. Meanwhile another site said what to do. DH opted to warm up the little guy in his hands while I made some homemade pedialyte and looked for a dropper to rehydrate him. I fed him a few droppers full and he perked up considerably, though he started rooting around DH's hand nibbling him trying to nurse. I microwaved some small towels and put them in a box and then lined them with a soft kitchen towel and tucked him in. He fell asleep right away. 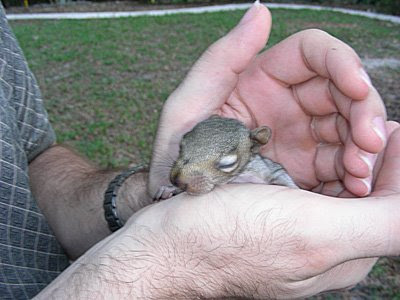 So that was our good deed of the day for yesterday: baby squirrel rescue. Considering how much squirrels love to dig up and kill my potted plants, well... but how could anyone resist such a cute little guy?